I write about travelling solo as a Muslim woman and doing volunteer work, and have embraced those as part of my identity. I’ve also spent countless mornings waking up crying and my body wrecked by multiple panic attacks, unable to carry on. Hello & assalamualaikum (peace be upon you). 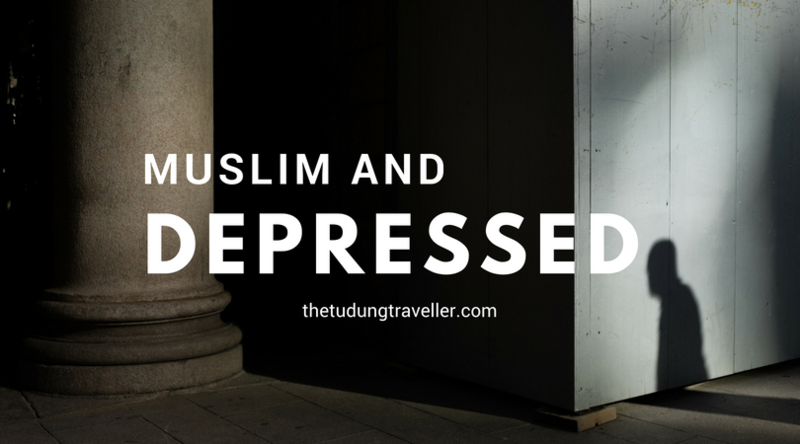 I’m Atikah, I’m Muslim, and I have depression. Well, if we really want to get into it, I have been diagnosed with manic-depression (bipolar disorder), panic disorder and post-traumatic stress disorder. I’ve been writing about living with mental health issues for the past few years, and have seen how the conversation has evolved. I’m from Singapore, I’ve lived in Australia, the UK and now the United States too, and I know it’s the same for many places – mental health is still such a taboo topic to discuss, even more so in the Muslim communities, so we just don’t talk about it. Well, not talking about something doesn’t make it go away. I personally know many who struggle quietly with mental illnesses. I’ve saved multiple people from their suicide attempts because they still wanted to give life a shot. I know some of you may have loved ones who have succumbed to suicide as well. How bad must it have been really, until one chooses to physically leave this world? Some of us go through traumatic experiences, ranging from abuse to accidents to divorce to deaths, and never had any outlet to process the difficult feelings and consequences. Some of us are genetically predisposed to mental illness, like being predisposed to diabetes. Sometimes it’s just rotten luck. Some of us get into a very dark place and we have no idea what to do with it. Nobody really tells us what to do; we get stuck in the hopelessness, in the barrenness of the new scary terrain, where it feels like all the fight has been taken out of us. The thing about mental illnesses is that it infiltrates into every aspect of your life. You can try to compartmentalise them into neat boxes but that’s not how it works. You wake up some days and the thunderstorm raging within you debilitates you into paralysis. I write about travelling solo as a Muslim woman and doing volunteer work, and have embraced those as part of my identity. I’ve also spent countless mornings waking up crying and my body wrecked by multiple panic attacks, unable to carry on with the day. I’ve hidden under my office table too many times, calming down a racing heart and mind. I’ve stared at the abyss of nothingness, considering taking away my life because that meant the unbearable pain will end and the heaviness of an uncertain future will no longer mean anything. My depression tells me that I am not worthy of love. My anxiety tells me I am difficult to love and that everyone will leave or abuse me. My mania leads me into making highly questionable decisions. Please never underestimate how hard people are trying to deal with their personal demons. Furthermore, it’s not only their demons they are battling with – they also fight fires with stigma. And you know what’s dangerous also? When you tell someone that whatever they’re feeling isn’t real, that all the pain is a sign that God is angry at them, that their test is because of weak faith. It becomes even more dangerous when they actually are being the best Muslims they can be – they’re doing all the prayers, both obligatory and sunnah. They’re fasting the sunnah fasts. They’re reading the Quran. They’re doing all that BUT they still have depression, they’re still mentally ill. That lack of positive feedback can lead to disastrous things like resentment, even more despair, or plain anger to God. For a very long time, I had many (well-intentioned, I’m sure) people telling me that my illnesses were because my faith is weak – that I didn’t pray enough, I wasn’t doing my deeds enough, or worst, that God is angry at me. I struggled to reconcile that with my belief of a Merciful and Loving God. I read Psychology as part of my degree, so I KNEW about mental illnesses, and I am very self-aware so I knew what I was experiencing was not normal, but it took me a very long time to come to terms with the darkness as an illness. Let’s be clear, depression is a clinical illness that can and should be diagnosed and treated medically and holistically. Yes, faith and spirituality are important components to mental health recovery and treatment, but it isn’t the only one. To be clear, praying helps me. Even and especially on days when I cannot get up, when I try to still have a semblance of a conversation with God, praying helps me. Some days I feel so empty, I just go through the motions when I do, but habits and routines are powerful things to keep one grounded especially in times of confusion and madness. Some days, I’m lying down with tears in my eyes, and I still try to talk to God. I’m sure He hears me. But it’s also important to remember that mental illnesses aren’t specifically caused by weak faith. I hate it when people trivialise & simplify it to “weak iman” because some of us go through a lot, like trauma. After so much has been put in into raising awareness that mental illnesses are legitimate and deserve attention, please do not go up to someone struggling and say, “Hey, I hope you get over it soon,” or “I know how you feel” or worst, “I’m sure it’s not as bad as you’re making it out to be. Cheer up.” No matter how well-intentioned you are – don’t. We really truly don’t know what other people are going through. We don’t know the battles and wars they need to wage every day. Some things are far too heavy to ever be carried alone. There is an incredible power to human kindness. If you know or suspect someone is struggling, reach out to them. They probably wont reach out because they’re already dealing with the darkness and so much shame because of it too. Their ability to act rationally is also possibly severely impaired so seeking help isn’t part of their daily equation of surviving. Offer a branch with a “Hey, you may not feel like it now, but know I’m always here when you’re ready.” Keep checking in, and swoop in to help with the slightest of notice. A little goes a really long way. Now, if we can start transforming the conversation into how we can support people with mental health issues within our (Muslim) communities and help them get better and recover, then we’re going to be building a more resilient, gracious and kind community. We’re going to build a society where suicide isn’t the only way through for some. How do we start? Educate yourselves on mental health issues and the help available, and share them generously and freely. Start talking about it. Start reaching out to help. Remember, sometimes the people who truly need help look a lot like people who don’t need help. If you know of any other sources for other countries, especially in Southeast Asia, do let me know so I can update this! Follow me on Instagram at @thetudungtraveller, where I share about my mental health journey candidly as well! A solo female traveller wearing the hijab turned mental health and inclusion advocate.